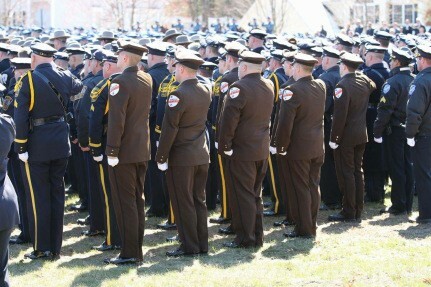 "Thousands of police and public safety officials locally and from around the country, including our very own UMass Memorial Emergency Medical Services paramedics, paid their respects to Trooper Thomas Clardy, 44, of Hudson, who was killed March 16 in a Massachusetts Turnpike crash in Charlton. In a show of support for their public safety colleagues, seven of our paramedics, pictured in brown uniforms at the burial service, were chosen as squad leaders to assist at funeral services. Our paramedics routinely work closely with State Police providing emergency medical support to the State Police Special Tactical Operations (STOP) and collaboratively with both agencies’ peer support teams." The IAEP wishes to recognize the dedication and support shown by Local President Bryan Urato and our members in Worcester, Ma. Our thoughts and prayers are with the family and friends of Trooper Thomas Clardy.